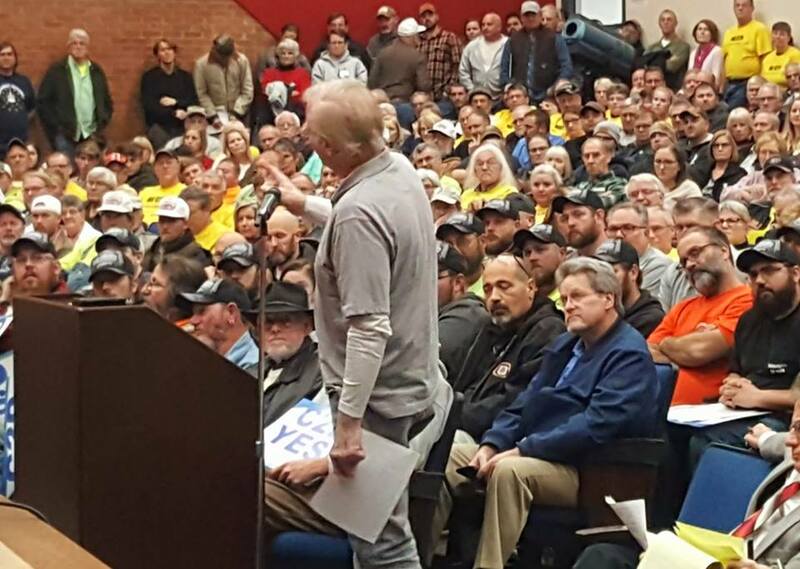 DALE -- Tempers flared last night during a public hearing on a proposed coal-to-diesel plant in Dale. The auditorium at Heritage Hills High School was overflowing, with many not able to get in to Wednesday night's public comment hearing. In a nutshell, supporters of the plan say it will bring hundreds of skilled jobs to the area, and thousands of construction jobs to get the plant built. "It's going to be a great facility," says Mike Falkenstein with Plumber's and Steam Fitters Local 136. "It's clean energy, It's not only going to put a lot of construction workers to work, it's going to get the coal industry back in Southern Indiana." But opponents to the plant have a different story to tell. They fear the health and environmental impacts and claim local companies are having a tough time filling the jobs they already have. The company’s air permit application shows the plant would release around 2.2 million tons of carbon dioxide, 225 tons of carbon monoxide and 120 tons of sulfur dioxide annually. IDEM released a study last month which stated the proposed plant would have no significant impact on public health or the environment. But some Dale residents say, without a senor to measure local conditions, there’s no way the IDEM study can be accurate. One resident said, "You think you can manage pollution, you can't. Any pollution is too much. It has a cumulative effect. It's sad people have to be here when you don't even have a baseline monitor (to study local air quality). How can you call anything you're doing 'scientific?'" Representatives from IDEM were just there to listen Wednesday night. They made no decisions or comments on the proposed plant. They’ll take the public comments into account when making a decision about whether to allow Riverview Energy to move forward with its plans.